Secretary of State John Forbes Kerry said Sunday he thinks Israel is “heading to a place of danger” because of settlement growth, and he had been “pushing uphill” with the Israeli government, because a majority of the ruling coalition does not support a two-state solution. There’s a basic choice that has to be made. Are there going to be continued settlements, is there going to be continued implementation of the settlement policy, or is there going to be a separation and the creation of two states? Kerry was speaking at the Brookings Institute, an organization whose leadership includes Martin Indyk, the man who ran John Kerry’s Israeli-Palestinian negotiations, and whose failure in turn set off the bloody Gaza War. Brookings is another think tank funded by George Soros, and his hate of Israel seems to have infected the institution, which pursues pro-Arab policies at the expense of the rest of the world. A recent NY Times article had some details from an investigation by Eric Lipton, Brooke Williams, and Nicholas Confessore. The expose, buried deep in the story and ignored by mainstream media, revolved around the role of Indyk, who cashed a $14.8 million check from Qatar in his capacity as vice president and director of the Foreign Policy Program at Brookings. Qatar is not just funder of Sunni terror groups in the Middle East, it is also the main patron of Hamas – the mortal enemy of both the State of Israel and Mahmoud Abbas’ Fatah party. Maybe Qatar’s $14.8 million doesn’t affect Brookings’ research projects or what the think tank’s scholars tell the media, including the New York Times, about subjects like Qatar, Hamas, Israel, Turkey, Saudi Arabia, and other related areas in which Qatar has key interests at stake. Maybe the think tank’s vaunted objectivity, and Indyk’s personal integrity and his pride in his career as a public servant, trump the large piles of vulgar Qatari natural gas money that keep the lights on and furnish the offices of Brookings scholars and pay their cell-phone bills and foreign travel. Besides Brookings, other think tanks funded by the Soros’ Ploughshares Fund include the Arms Control Association, and the Atlantic Council, according to the AP. 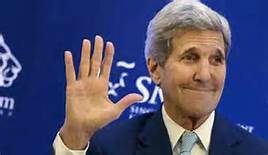 Is being a pal of Indyk, the Iran Deal and a host of other foreign relations’ failures, show bad luck or just poor judgment on Kerry’s part? Secretary of State John Kerry said in Vienna on Friday that air conditioners and refrigerators are as big of a threat to life as the threat of terrorism posed by groups like the Islamic State. The Washington Examiner reported that Kerry was in Vienna to amend the 1987 Montreal Protocol that would phase out hydro-fluorocarbons, or HFCs, from basic household and commercial appliances like air conditioners, refrigerators, and inhalers. While Kerry can be excused for exaggeration, he can’t believe what he says about conserving energy and saving the environment, calling global warming our number one enemy. Wife Teresa Heinz and Kerry own a six-floor, $7 million townhome in Boston’s Beacon Hill neighborhood, an ocean-front home on Nantucket, just sold for $25 million, a $5 million ski retreat in Idaho, a $4 million estate in Fox Chapel, Pennsylvania, near the Heinz family’s home base of Pittsburgh, and a $5 million home in the Georgetown neighborhood of Washington, D.C. Sounds like a big “carbon footprint” to me. Imagine the electric bill for all that central air. It’s a new turn on an old phrase. Israel gets two F-35s – only because fog lifts in Italy!